Last Friday, Swan’s Market seemed to have shrugged off its longtime curse, if only for a night. 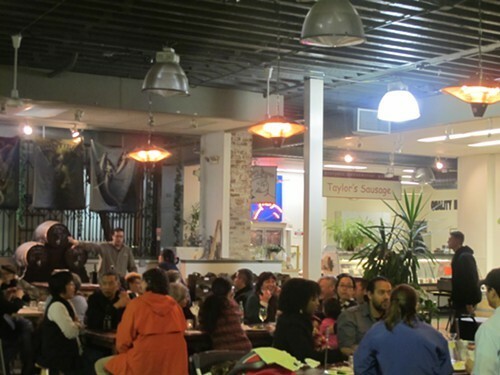 In the midst of bitter winds and rain, die-hard diners packed Cosecha’s wooden tables for a night of pop-up meets brick-and-mortar. Against one wall was ever-industrious Tina Tamale, serving up several varieties of her eponymous items; chorizo and Cajun chicken sausage sandwiches from Taylor’s; and Korean-spiced pulled pork sandwiches from Chef Peter Jackson (Toast, Boucherie Artisanal Meats). Next to Tina, Maricela Yee of Little Shop Artisan Box sold tea, chocolate, and coconut jam from her monthly subscription boxes. On the back wall, soon-to-open Periscope Cellars (operating on a special-events permit for the time being) doled out wine by the glass or the bottle, as well as a weather-appropriate hot mulled wine. And Cosecha held it down on the other side with a special menu of carne adovada and tacos made with homemade flour tortillas. Swan’s hosted its first pop-up in December, to coincide with the arrival of Popuphood, but officially launched the events in the beginning of March. Karoleen Feng of the East Bay Asian Local Development Corporation (Swan’s owners) said different vendors like Blue Chair Fruit Jams have cycled through already, and they have others lined up for the future. Cosecha has staged occasional one-off dinners in the past, but owner Dominica Rice said she now plans to stay open every Friday for the foreseeable future. “It was so lonely before!” she said. “It’s really nice to have all this company.” Tina Tamale will not be returning, but this Friday Pietisserie, Donut Dolly, and others will join Rice at the market. Follow Swan's Market on Facebook for updates.